IN RECENT YEARS, I have been fortunate enough to translate four books by Jennifer Egan into Spanish for the Spanish publishing market: A Visit from the Goon Squad (El tiempo es un canalla, Minúscula, 2012), followed by The Keep (La torre del homenaje, Minúscula, 2013), Emerald City (Ciudad Esmeralda, Minúscula, 2016) and, more recently, Manhattan Beach (Salamandra, 2019). Translating Egan is a joy. While usually a translator is eager to forge ahead with the highest pages-per-day ratio she can honestly produce, with Egan’s books you don’t ever want to get to the last page, because you know you will miss everything about it once you are done. After translating two hundred titles from English and German into Spanish and Catalan, I am painfully aware of how uncommon an experience that can be. Egan is a rara avis, always keen on exploring new formats, trying on new voices and styles. “I wanted to avoid centrality. I wanted polyphony. I wanted a lateral feeling, not a forward feeling,” said Egan about her writing of A Visit from the Goon Squad. She is a highly versatile author indeed: in the short span of ten years, she published a neogothic novel, then a rather experimental volume of short stories in which characters and plots are intertwined to the point of blurring the limits between short story and chapter, resulting in a sort of composite novel and including one story written in PowerPoint format—a book that, incidentally, earned her the Pulitzer Prize for Fiction—then a Twitter novel, and, finally, a surprisingly genre-tight historical novel about wartime New York with a feminist twist. The pleasure of the task at hand lies partly in the fact that the original is animated by the energy of logic (a concept favored by Egan), both at the level of the sentence and as a whole. Such stylistic variance can create an additional difficulty, as finding the voice and tone in a text is one of the first hurdles for a translator. If an author keeps changing everything about her work as a principle, the challenges of translating her increase. As it turns out, though, the best-written books tend also to be “easier” to translate: the pleasure of the task at hand lies partly in the fact that the original is animated by the energy of logic (a concept favored by Egan), both at the level of the sentence and as a whole. When everything in the original clicks, a translation flows beautifully and the translator can ideally focus on other relevant details. The decision about the level of engagement required in a given translation challenge depends greatly on a translator’s intuition, an invaluable resource that occasionally can also turn into a double-edged sword. Intuition is your experience making more or less conscious decisions. 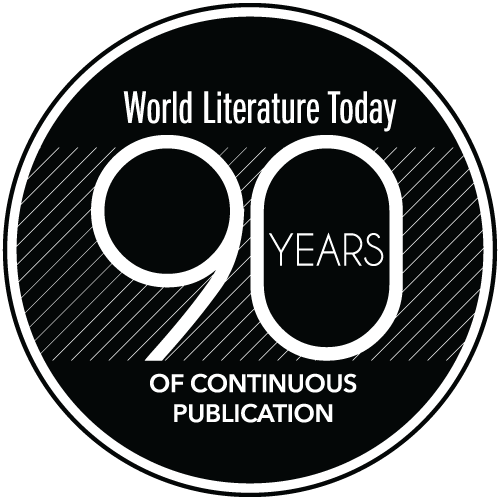 A translator’s baggage, together with her familiarity with the text, subject, author, style, or medium, will increase the potential role of intuition, ultimately speeding the process of translation, a desired outcome in most scenarios, but certainly a must in markets that underpay translators, such as the literary translation market in Spain (where, if translation is your only source of income, you will need to produce at least ten pages a day, every day of the week, every month, for years, just to get by). I have used the verb “produce,” but that is an understatement. When talking about his stint as a translator during his early years as an aspiring writer in Paris, Paul Auster is bolder: “I translated half a dozen books with my wife, Lydia Davis. These translations were our primary source of income . . . and even though our rate kept increasing from book to book, we were scarcely a penny or two ahead of the minimum wage. The key was to work fast, to crank out the translations as quickly as we could and never stop for breath.”1 Anyone translating literature in Spain for a living will relate to that feeling. Intuition is your experience making more or less conscious decisions. Great originals invite intuition in, and that can introduce a collateral risk of overconfidence: overjoyed by her work, the translator can be prone to handing the wheel over to her instincts a little too freely, while she rejoices in admiring the landscape of her sentences, paragraphs, and pages. The problem of translation as a self-driven car is the suspension of doubt. A literary translator is necessarily full of doubt, as that’s what pushes her to research and consider alternative, not-so-obvious options. Doubt, in fact, is a trait good translators share with good authors. 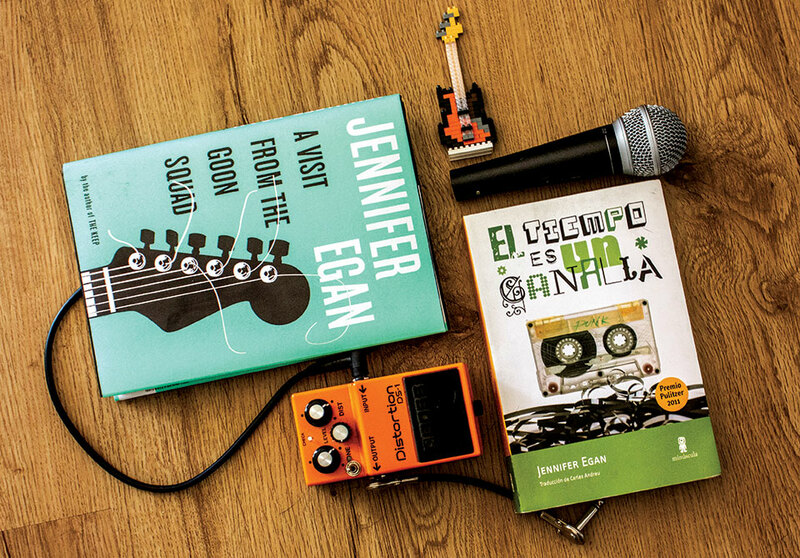 When asked about her process of writing her much-discussed PowerPoint story, “Great Rock and Roll Pauses,” from A Visit from the Goon Squad, Egan said: “I began—as I would with any new genre—by reading widely in it. In the case of PowerPoint, of course, that meant reading a lot of corporate documents.”2 This translator, on the other hand, hardly had the luxury of researching “widely” in order to make the translated story work, partly because I had to produce a functioning version of the seventy-six-slide text in around three days (and this is despite the fact that Jennifer Egan’s Spanish publisher offers some of the best rates in the Spanish translation market). My doubts, in this case, were circumscribed mostly by questions of format: Spanish translations tend to be longer than their English originals. Would my translation fit in the limited space of the slides? Would we need to use a smaller font? Would that affect readability? There is no good solution to this—Spanish texts are just longer—but with that in mind one can at least take palliative measures. In this particular case, the strangeness of the form probably helped to rein in my intuition and to make more mindful decisions. Great originals invite intuition in, and that can introduce a collateral risk of overconfidence. It let in the worm: another word Danny and his friends had invented all those years ago, smoking pot or doing lines of coke and wondering what to call that thing that happened to people when they lost confidence and got phony, anxious, weird. The Spanish direct equivalent for “worm” is gusano. But, somehow, while translating that text, my intuition told me that a “worm” had a somewhat threatening nature to it that gusano did not. The fourth definition of “worm” in the Collins dictionary is “insidiously tormenting or devouring force,” a meaning that fits very well with the worm in the novel but one that the Spanish term gusano does not include. In my translation I opted for anaconda instead, a word I had often heard some sports commentators in Barcelona use to describe the feeling fans have in the hours building up to an important game. I trusted my intuition that gusano did not work in my translation and took the risk, as you have to do countless times in any given book. Months later, a reviewer questioned this very choice, which he considered to be “unheard of.” After doing some soul-searching about the nature of my decision, I had to admit I had not really given it much thought. And even if I still understood my reasons for that metamorphosis, I couldn’t help but think that maybe my intuition had betrayed me in telling me that “worm” occupied a wider semantic field than gusano. Had I gone too far with my decision? The problem of translation as a self-driven car is the suspension of doubt. My (belated) research revealed that, while gusano comes from the Latin cossus (which, in turn, comes from the Sanskrit kusu, “earth-born”), “worm” derives from Old English wyrm and wurm, a dragon or snake. I also found out that Bram Stoker had written a novel, The Lair of the White Worm, based on an old English legend, “The Lambton Worm,” about a giant snake or dragon that terrorized the people of Lambton. And while Stoker’s novel had been translated as La guarida del gusano blanco in Spanish, both the German translation and the Italian version of the movie based on the novel had gone with snakes: Das Schloss der Schlange (The castle of the snake) and La tana del serpente bianco (The white snake’s lair). In fact, the Spanish book also portrays a huge dragon on the cover. I now had evidence to support my intuition that the Spanish reader, even without the slightest inkling about its etymology, would have never connected gusano with the anxious feeling it is ascribed in Egan’s book. So turning a worm into a snake is not “unheard of.” Some animals are just like that, prone to changing their genus in the linguistic transit. After all, the English “bookworm” turns into a “library rat” (rata de biblioteca) in Spanish. Was my intuition validated after these findings? Yes. Somewhat. Was I fully convinced about my decision? No: a translator not only is but usually also remains full of doubt. Also, in the final scene of the book a group of people emerge from under the earth in a way that’s very wormlike. In the end, though, sometimes the task of a translator consists in choosing between options that are only partially satisfactory. 1 Paul Auster, “Hand to Mouth,” in Collected Prose (Picador, 2005). 2 Stephanie Lee, “Jennifer Egan on ‘Goon Squad,’ Los Angeles Times’ Brouhaha, and Her Next Novel,” Entertainment, April 2, 2011. In addition to Jennifer Egan, Carles Adreu has translated works by Adam Johnson, Dana Spiotta, Gerald Murnane, Doris Lessing, Ingo Schulze, Uwe Timm, and others. 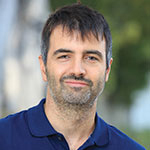 An assistant professor of translation at the Middlebury Institute of International Studies at Monterey, he holds an MA in comparative literature from Universitat de Barcelona.